Dame Zara Bate, DBE, (March 10, 1909 - June 14, 1989) was an Australian fashion designer and wife (later widow) of Prime Minister Harold Holt. Born Zara Kate Dickins in Kew, Victoria, Bate was educated at Ruyton Girls' School and Toorak College. In 1925, aged 16, she established her first dress shop in Little Collins Street. With a friend, she later opened a salon, called Magg, in Toorak Village. She won the 1961 Australian Gown of the Year award. Her first husband was Colonel James Fell, by whom she had three sons, Nicholas (1937) and twins Sam and Andrew (1939). Their marriage broke down soon after the birth of the twins. After they divorced, in 1947 she married Harold Holt, a Liberal Party politician. He legally adopted her children and gave them his surname. Tom Frame's biography The Life and Death of Harold Holt reveals that Holt was the twins' biological father. Harold Holt had been a member of Robert Menzies' Cabinet continuously since 1949, becoming deputy Liberal leader in 1956 and Treasurer in 1958. When Menzies retired in January 1966, Holt became Prime Minister. He was presumed drowned in December 1967. Zara Holt was created a Dame Commander of the British Empire in the Queen's Birthday Honours of June 1968, for "devotion to the public interest". 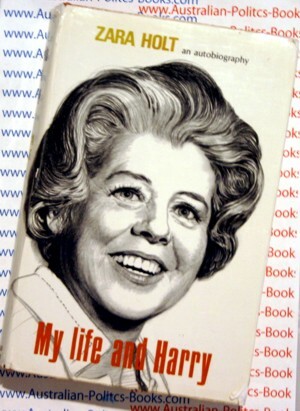 In 1968 Dame Zara published My Life and Harry: An autobiography. In February 1969, Dame Zara Holt married Jeff Bate, a farmer and Liberal politician. She then became known as Dame Zara Bate. It was the third marriage for both of them. After Jeff Bate's death in 1984, Dame Zara retired to the Gold Coast, where she died in 1989 at age 80. Harold Edward Holt, CH (5 August 1908 – 17 December 1967), was an Australian politician who became the 17th Prime Minister of Australia in 1966. His term as Prime Minister dramatically ended in December of the following year when he disappeared while swimming at Cheviot Beach near Portsea, Victoria and was presumed drowned. Holt spent 32 years in Parliament, including many years as a senior Cabinet Minister, but was Prime Minister for only 22 months. This necessarily limited his personal and political impact, especially when compared to his immediate predecessor Robert Menzies, who was Prime Minister for a total of 18 years.Today, Holt is mainly remembered for his controversial role in expanding Australia's involvement in the Vietnam War, for his famous "All the way with LBJ" quote, and for the sensational circumstances of his death. In the opinion of his biographer Tom Frame, these have tended to obscure the many achievements of Holt's long and distinguished political career. Harold Holt was the elder of two children of Thomas and Olive (Williams) Holt. He was born in the Sydney suburb of Stanmore on 5 August 1908. He and his brother Cliff (Clifford Thomas Holt, b. 1910) spent their early life in Sydney and attended three different schools in Sydney and Adelaide between 1913 and 1919. In 1921 Thomas Holt enrolled his sons at the prestigious Wesley College in Melbourne, where the future Prime Minister Robert Menzies had been a star pupil. By this time Thomas Holt had left teaching and moved into theatrical and artist management in partnership with the noted entrepreneur Hugh D. Macintosh, owner of the Tivoli theatre circuit. For several years in the early 1930s he was based in London. Harold Holt's parents divorced in 1918. His mother died in 1924, when he was sixteen, and he did not attend her funeral. A lack of parental affection, his parents' divorce and his mother's early death instilled deep feelings of loneliness and insecurity in the young Holt. This drove him to seek approval and acclaim through personal endeavour and career achievement, and fuelled his eagerness to please others and his need to be liked. A formative event was his singing performance at his school's annual Speech Night in December 1926 — none of his family were present, and the sense of loneliness he felt that night remained with him throughout his life. Holt won a scholarship to Queen's College at the University of Melbourne and began his law degree in 1927. He excelled in many areas of university life — he won College 'Blues' for cricket and Australian rules football, as well as the College Oratory and Essay Prize. He was a member of the Melbourne Inter-University Debating team and the United Australia Organization 'A' Grade debating team, and was president of both the Sports and Social Club and the Law Students' Society. While at university, Holt met Zara Kate Dickens, and they soon became lovers, but split up in 1934 and Zara travelled overseas. In London she met Captain James Fell, a British Army officer, and they married later in March 1935. Her first son Nicholas was born in 1937, followed by twin boys Sam and Andrew, born in 1939. By this time, however, she had renewed her relationship with Holt and her marriage to Fell ended soon after the twins' birth. Tom Frame's biography reveals that Holt was the twins' biological father. Zara and Fell subsequently divorced and she eventually married Holt in 1946. He adopted the three boys. Although they remained married until Holt's death in 1967, Zara's memoirs confirmed longstanding rumours that Holt had a number of extramarital affairs. Holt graduated as a Bachelor of Laws in 1930. He was admitted to the Victorian Bar in November 1932 and served his articles with the Melbourne firm of Fink, Best & Miller, but the Depression meant that he was unable to find work as a barrister. His father (then based in London) wanted him to further his studies in England, but the worsening economy also made this impossible. Holt was drawn to politics in the early 1930s and joined the Prahran branch of the United Australia Party (UAP) in around 1933. In 1934 he unsuccessfully contested the federal seat of Yarra for the UAP, running against James Scullin. In March 1935, he unsuccessfully contested the Victorian state seat of Clifton Hill. Holt stood again for Fawkner in 1935 and this time social connections enabled him to gain preselection as the UAP candidate and he was elected to the House of Representatives in a by-election on 17 August 1935, becoming, at age 27, one of Australia's youngest-ever MPs. From this point on Holt dedicated himself single-mindedly to a career in politics, and he reportedly had few outside interests, apart from his well-known passion for sport and the sea. He was a 'workaholic', typically working up to 16 hours a day and subsisting on 4-5 hours sleep each night. In 1939, Holt's mentor Robert Menzies became Prime Minister after the sudden death of the incumbent Joseph Lyons and the short-term caretaker ministry of Sir Earle Page. Holt's energy, dedication and ability earned him rapid promotion and in April 1939 he was appointed Minister without Portfolio assisting the Minister for Supply and Development. In October 1939 he became Minister in charge of Scientific and Industrial Research, and during November-December 1939 he was Acting Minister for Air and Civil Aviation. In May 1940, without resigning his seat, Holt joined the 2nd Australian Imperial Force as a gunner, but a few months later three Cabinet ministers and several of Australia's top military staff were killed in an air crash in Canberra. Menzies recalled Holt from the army, appointing him Minister without Portfolio assisting the Minister for Trade and Customs, and his recall earned him the ironic nickname "Gunner Holt." In October 1940 Holt was elevated to Cabinet, becoming Minister for Labour and National Service, and one of his most significant achievements in this portfolio was the introduction of the Child Endowment Act, passed in April 1941. In August 1941, a front-bench revolt forced Menzies to resign as Prime Minister. He was replaced by the Country Party leader Arthur Fadden. Holt was among those who withdrew their support, although he never revealed his reasons for doing so. In October 1941, the UAP was ousted by a no-confidence vote, the ALP leader John Curtin was invited to form a new government, and Menzies resigned as UAP leader. By 1944 the UAP had effectively disintegrated and in 1945 Menzies formally established a new political party, the Liberal Party of Australia, and forged an enduring coalition with the Country Party. Holt was one of the first members to join the Liberal Party's Prahran branch. After eight years in opposition, the Coalition won the federal election of December 1949 and Menzies began his record second term as Prime Minister. Holt was appointed to the prestigious positions of Minister for Labour and National Service (1949-1958) and Minister for Immigration (1949-1956), by which time he was being touted in the press as a "certain successor to Menzies and a potential Prime Minister". In Immigration, Holt continued and expanded the massive immigration program initiated by his ALP predecessor, Arthur Calwell, and he displayed a more flexible and caring attitude than Calwell, who was a strong advocate of the White Australia Policy. Holt excelled in the Labour portfolio and he has been described as one of the best Labour ministers since Federation. Although the conditions were ripe for industrial unrest – Communist influence in the union movement was then at its peak, and the right-wing faction in Cabinet was openly agitating for a showdown with the unions – the combination of strong economic growth and Holt's enlightened approach to industrial relations saw the number of working hours lost to strikes fall dramatically, from over two million in 1949 to just 439,000 in 1958. Holt fostered greater collaboration between the government, the courts, employers and trade unions. He enjoyed good relationships with union leaders like Albert Monk, President of the ACTU, and Jim Healy, leader of the radical Waterside Workers' Federation and he gained a reputation for tolerance, restraint and a willingness to compromise, although his controversial decision to use troops to take control of cargo facilities during a waterside dispute in Bowen, Queensland in September 1953 provoked bitter criticism. Holt's personal profile and political standing grew through the 1950s. He served on numerous committees and overseas delegations, he was appointed a Privy Counsellor in 1953, and in 1954 he was named one of Australia's six best-dressed men. In 1956 he was elected Deputy Leader of the Liberal Party and became Leader of the House, and from this point on he was generally acknowledged as Menzies' heir apparent. In December 1958, following the retirement of Arthur Fadden, Holt was appointed Treasurer. He delivered his first Budget in August 1959 and his achievements included major reforms to the banking system (originated by Fadden) – including the establishment of the Reserve Bank of Australia – and the planning and preparation for the introduction of decimal currency. However, in November 1960, Holt brought down a mini-budget in an attempt to slow consumption, control inflation and reduce the deficit, but it triggered the worst credit squeeze since 1945. The economy was driven into recession – the stock market slumped, private investment, housing activity and motor vehicle sales fell, unemployment rose to almost 2 percent (the highest rate since the Depression) and several major companies collapsed. Holt's blunder nearly derailed his own career, and it brought the Coalition dangerously close to losing the 1961 election, which they won with a precarious one-seat majority (the seat, Moreton, was won by Jim Killen). Holt was roundly criticised, his public profile was damaged, and he later described 1960-61 as "my most difficult year in public life". But Holt's political stock, like the economy, soon recovered. He continued as federal Treasurer until January 1966, when Menzies finally retired as Prime Minister and Holt was elected leader, thus becoming Prime Minister. By this time he had been an MP for almost thirty-one years – the longest wait of any non-caretaker Australian Prime Minister. Holt's short term in office meant that he had a limited personal and political impact as Prime Minister, and he is mainly remembered for the unusual circumstances of his disappearance and death. This has tended to obscure the major events and political trends of his term in office, especially his role in maintaining and expanding Australia's military commitment to the Vietnam War. In terms of national politics, the most significant aspect of Holt's tenure as Prime Minister is that it marked the beginning of an unprecedented period of internal turmoil for the Liberals and a rapid decline in the party's electoral fortunes. For twenty-two years, from its founding in 1944 to his retirement in 1966, the Liberal Party had had only one leader – Robert Menzies. After his retirement, the party had three leaders in the six years between 1966 and 1972; in December 1972 the Coalition's 23-year hold on power ended with a resounding electoral loss to the ALP under Gough Whitlam. The transfer of power from Menzies to Holt in February 1966 was unproblematic, and at the federal election later that year the electorate overwhelmingly endorsed Holt, re-electing the Holt-McEwen Coalition government with 56% of the two party preferred vote. As of 2007, this stands as the greatest winning margin at a federal election in Australian political history. But behind the scenes, Menzies' retirement had left a power vacuum in the party, and internal divisions soon emerged. Menzies' dominance over the party, and the fact that Holt's succession had been established for many years, meant that a secure second rank of leadership had not developed. Holt's disappearance at the end of 1967 forced the party to choose a "wild card" successor from the Senate after the leading contender, deputy Liberal leader William McMahon, was unexpectedly eliminated from the contest by their Coalition partners, the Country Party. The political historian James Jupp says that, in domestic policy, Holt identified with the reformist wing of Victorian Liberalism. In one of his most notable achievements, he began the process of breaking down the White Australia Policy, by ending the distinction between Asian and European migrants and by permitting skilled Asians to settle with their families. He also established the Australian Council for the Arts (later the Australia Council), which began the tradition of federal government support for Australian arts and artists, an initiative that was considerably expanded by Holt's successor John Gorton. In the area of constitutional reform, an important event of Holt's time as Prime Minister was the 1967 referendum in which an overwhelming majority of Australians voted in favour of giving the Commonwealth power to legislate specifically for indigenous Australians and in favour of Aborigines being included in the national census. In economics, Holt's tenure began with the introduction of Australia's new system of decimal currency, introduced on 14 February 1966. Although all the preparatory work for the changeover had been done while Menzies was Prime Minister, Holt had particular responsibility as Treasurer for currency matters, and he was highly involved in both the decision to change and its implementation. In 1967 his government made the historic decision not to depreciate the Australian dollar in line with Britain's depreciation of the pound sterling, a custom that Australia had previously always followed, but this decision created increasing dissent within the Coalition, particularly in the Country Party, which saw the move as a threat to Australia's balance of payments and felt that it would lead to increased production costs for primary industry.